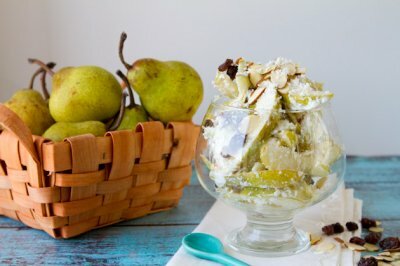 Cool off with this creamy fruit salad made with fresh pears, slivered almonds and goat cheese feta crumbles. Add dressing ingredients to a medium-sized bowl. Whisk to combine. 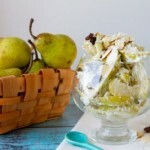 Drop in remaining ingredients, stir to coat and serve with additional raisins and slivered almonds.